Mittens Writes: Tuesday. Today stinks so bad I could cry. Today started out great. I was all psyched up to write, since I wouldn't be able to work on the deck. First thing I had to do was balance the checkbook. I handled that like a pro, and moved on to the internets. I got all my email and things sorted and squared away, and then was ready to sit down and write. Yay! Then the guy painting my house showed up and said we'd need more paint. Could I run out to Lowe's again and buy a few more gallons? Gah! So I did. That's three trips to Lowe's in six days. I'm really getting sick of that place. Turns out, I need to go back AGAIN and buy one more gallon. I could have cried. Then we have a serious bit of drama going on with a friend of mine who has escalated a minor passing disagreement into a federal case. It has eaten a large part of my day, and filled me with distress. That's all I'll say about it here, but let it be known that it really eats at me that anyone who has a problem with me doesn't just say so to my face, but runs around and causes problems for all kinds of other people because of it. I'm not stupid, and we are not children. If you have a problem with me, just tell me, darn it! Don't run off and tattle to others, please. Then, I had to run off to chorus practice, where a friend and I rehashed all that drama yet again. When we were done, I checked my email real quick, and realized I'd heard back from the agent who has my full manuscript. She rejected it, but with some very insightful advice, which I'm taking into consideration, and planning a whole rewrite of the first novel. Which means I'll have to trash most of the second novel, as well. The revisions she suggested, which mostly consists of bringing the two main characters together romantically, happens in book two, and that's about half the story line of the second novel. What they go through makes them realize they belong together. If I have to move all that to book one, I'll have to completely rewrite both books. And the third book I'm working on right now should basically just sit and go unwritten for now, if the first two books are going to undergo that much change. Pointless to keep writing it until the first two novels are rewritten. Right? 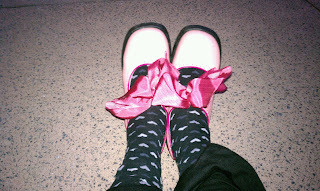 Not even wearing my pink shoes could keep me from wallowing in the doldrums today. No, not even these puppies could cheer me up after all that. I can't wait for Tim to wake up, so I can ask him what he thinks about all of this. I don't know whether to be happy to get so much great revision advice, or to cry because of just how much work will go to waste if I take it. Then again, it's good advice. If I don't take it, I might never get published at all. And then EVERY SINGLE BIT of work will have been wasted, technically. Who the heck knows? I certainly don't. I've decided to wait until tomorrow to make any decisions on what to do now. I've also decided not to cry, which is an improvement. Glad I had this chance to share.